And during... isn't she a good sport? When Emma was a baby, we used to say she couldn't not smile. No matter how big the tears were in her eyes, she always had a smile. Of course she chose pink rubber bands and purple elastics. Ellie liked her choice of "tooth bling"
So that's three down... four to go! Oh, she looks so pretty! I always have thought that braces make a person's smile look bigger, a.k.a. better. Wow, 3 down and 4 to go! Our dentist thinks 3 of our 5 need them right now, but our pocketbook says differently. We'll do one at a time in the very near future. She looks so adorably cute! ♥ my little girl. I like her tooth bling, too! So sorry I have not been by in a while. I have not forgotten about you. Crazy here! It seems every friend I have is in some sort of crisis...most of them are serious medical ones. I had surgery a few weeks ago...I am trying to get my youngest thru his last year of high school...home school style. Well, that is just a little of what is happening in our corner of the world. 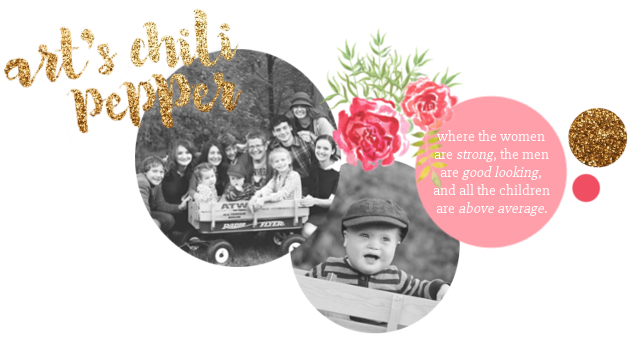 I hear there is congratulations on the way and praise GOD for the newest little chili pepper to enter your lives.